Get ready for your family Easter celebrations with these handmade DIY Easter egg crafts and decorations that are perfect to make this spring. This Easter, surprise everyone in your family at breakfast with their own speckled eggshell gift basket filled with chocolate eggs to give them a sweet start to their day. Beautifully display all the decorated Easter eggs your family decorated this spring on your kitchen table in some handmade paint dipped Easter egg cups. A fun craft you can eat! These Easter Egg cake pops are as adorable as they are delicious. Get creative with the decor on your egg pops. Make your own egg-shaped candles to light on your table this Easter with this great DIY project. Get ready for the big Easter Egg hunt party you will be hosting by decorating your house by hanging several multi-colored DIY honeycomb Easter egg garlands across the walls in your house or group several together over the food table to quickly get your ready for the party. This one's for the kids! This simple science experiment will intrigue your kiddos, and they'll love the sparkly eggs. Check out 6 more Easter Egg crafts for kids. Paint pre-made oval paper mache boxes in pastel colors to look like an Easter egg and fill the completed boxes with chocolate Easter eggs for an easy gift that is perfect to give to your co-workers or neighbors this spring. Help promote conversation at your Easter brunch by pre-arranging where everyone will sit at the table by placing handmade Easter egg place cards with everyone's name on a small piece of paper that can sit in the top of the egg. The chic DIY Easter Egg place card holders look gem-like with the faceted design but are very easy to sculpt out of oven baking clay. Add some Easter eggs to your dining table in an unexpected way by repurposing some of your old plastic Easter eggs into candle holders perfect for holding pillar candles. Recycle one of your old oval trays by decorating it to look like an Easter egg using pieces of tissue paper that are stuck onto the tray. The completed tray can then be used to serve snacks and drinks at your Easter celebration this spring, and be stored to be used again every following Easter. Cupcakes or other small desserts will look immediately grander when served on a mini marble pedestal. This stylish marble dessert stand is perfect for Easter as it uses a plastic Easter egg as the base of the stand, which also makes it a great way to use up those remaining plastic eggs you have around the house. Young children will love having the opportunity to build their own Easter egg necklace to wear while on their Easter Egg hunt with this simple DIY project that strings together plastic Easter eggs in a variety of colors. Surprise someone you love with a giant floral Easter egg this Easter to show them how much they mean to you. Easily decorate any plain cake to be perfect for your Easter celebrations by making Easter egg cake toppers out of paper that you can stick into the top of your cake to easily make it look professionally decorated. 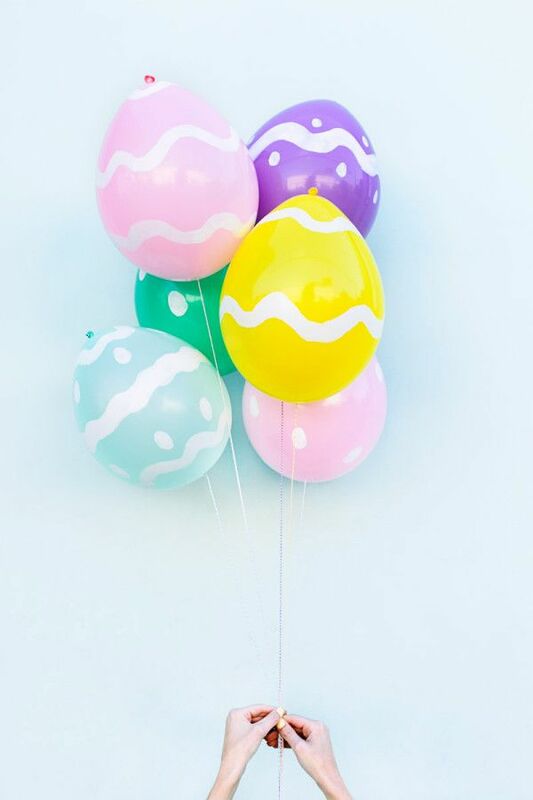 Take regular balloons and decorate them too look Easter eggs with this simple DIY project that is perfect to decorate your house this Easter and is sure to be a hit with the kids at the party. The needle-crafters in your life will love this beautifully embroidered Easter Egg pin cushion. Try this project, or check out one of these 10 other Easter Egg inspired embroidery projects. Add some sophistication to your Easter table setting with these lovely handmade marble Easter egg place card holders. Use one large bag of plastic Easter eggs to make a wreath perfect to hang on your front door this spring. While the children are doing their Easter egg hunt make sure the adults also get some chocolate by presenting each of them with their own Easter egg box filled with candy. Tonight get ready for Easter by making these fun Easter egg salt and pepper shakers which are perfect for your Easter brunch. Send your child off to school with these DIY Easter egg treat bags that you can quickly assemble by attaching the printable label to a small plastic lunch bag filled with a few candies. Are you still searching for some candy-free Easter gift ideas? If so these eggs which happen to look like chocolate would be a perfect DIY gift idea as they are actually chocolate bars of soap! Get everyone laughing on Easter with these DIY cards with Easter eggs or bunnies that you can scratch off to reveal an Easter-themed joke. Make a decorative treat bag to gift all your friends and family come Easter time. This project tutorial also includes an adorable Easter Bunny or Chick option. For an easy party favor for all your guests, this Easter by making them a small Easter egg cup filled with candy to thank them for attending your event. After the Easter egg hunt is over, keep all the children entertained by having them take turns trying to crack the giant Easter egg pinata by smacking it on their turn with a large stick. Instead of buying egg honeycombs to decorate your home this Easter learn how to make your own using sheets of tissue paper with this amazing DIY project! Enhance your wrapped Easter gifts with these cute Easter egg stickers that you can easily DIY. Help your kids get excited about their upcoming Easter egg hunting by making an Easter egg wreath that you can hang on the front door so that your children can see it every day on their way back from school.